The upcoming week looks cool and unsettled overall with chances for rain almost each day. For Monday, expect partly sunny skies during the morning, then increasing clouds during the afternoon. Highs in the low to mid 70s. Tonight, a few rain showers will be possible. But, only light rain amounts are expected. On Tuesday, it will be cloudy and cool with another chance for rain showers. Wednesday looks to be drier. But, Thursday brings the week’s best chance for rain with showers likely due to a Gulf low. 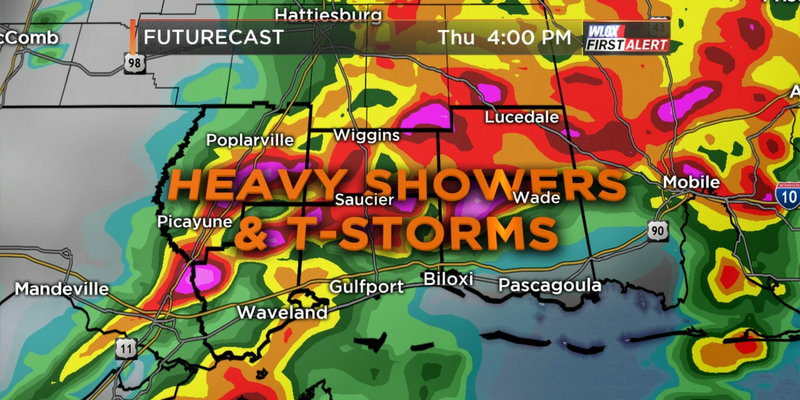 Moderate rainfall of over a half-inch will be possible on Thursday. Things finally dry up by the weekend with a nice, dry, and seasonable Saturday and Sunday. Tropics remain quiet and we are just over a month away from the end of hurricane season. Some of Thursday's thunderstorms may become severe, causing warnings and possibly damage. Widespread showers and thunderstorms are expected on Thursday, especially in the afternoon and evening hours.